Port Blair, Nov. 28: TheLt Governor, Lt Gen (Retd) A. K. Singh today chaired the LG’s Advisory Council meeting at the conference hall of Raj Niwas. In his introductory speech, the LG said that the Advisory Council is a very important forum for deliberating on key issues concerning the Islands and added that everyone present here in the meeting is an expert in his own field and suggestions given in this meeting will be very important for the development of the Islands and welfare of the people. The Lt Governor further said that in the absence of a Legislative Assembly in the Islands, it is very essential that the views of the representatives of people are taken into consideration. Explaining his vision for the development of the Islands, he said “I had already spelled out my vision of development in my Independence Day message. The development model for the Islands will be sustainable and inclusive growth, keeping in mind the fragile ecosystem and the indigenous tribes”. On functioning of Panchayati Raj Institutions, he said PRIs are the backbone of the Islands and the roots of democracy. “Our Panchayati Raj Institutions in the Islands are evolving and we have to allow them time to mature and flourish”, he said. On the security aspect, he said the Andaman and Nicobar Islands are of great strategic value to the country and its development will be done keeping its strategic importance in mind. “From a strategic outpost, we have to make these Islands into a strategic springboard in tune with our Look East Policy”. On the recent cyclone ‘Lehar’, he expressed his satisfaction with the response of the Administration in dealing with relief and rescue works. He praised Andaman Nicobar Command and Coast Guard for their commendable services in rescuing the missing fishermen. This meeting of the LG’s Advisory Council was held after almost a gap of 2 years. It was decided that this Council would meet once in a quarter to deliberate on all important issues relating to the Islands. Chief Secretary, Shri Anand Prakash made a presentation on the Administration’s vision of development and the focus areas. 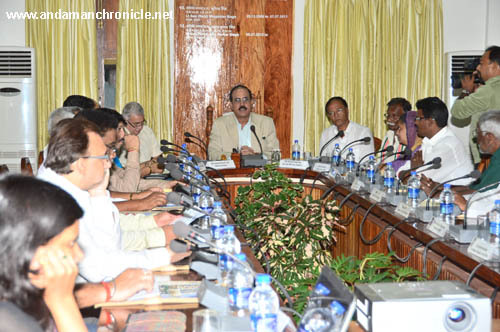 The Council deliberated on issues such as education policy, issue of encroachments, housing project and other major projects of the Port Blair Municipal Council. The Hon’ble Member of Parliament, Shri B. P. Ray, Shri Kuldeep Rai Sharma, President, PCC, Shri Vishal Jolly, President, BJP State Unit, and heads of major political parties attended the meeting. Also present were Chairperson (PBMC), Adhyaksha, Zilla Parishad (SA) and Adhyaksh, Zilla Parishad (M&N Andaman), Chief Captain, Tribal Council (Car Nicobar), Chairperson (SSWB), Pramukhs of the seven Panchayati Samitis, representatives of Andaman Chamber of Commerce and Industries (ACCI) and some experts as special invitees. A number of valuable suggestions were received from the members during the deliberation. In his concluding remarks, the Lt Governor expressed his satisfaction that the members of the Advisory Council were up-front in expressing their views and raised important issues relating to the welfare of the people of the Islands. He conveyed his appreciation to all members of the Council. Cyclone Lehar: It was an experience in itself for the people of the islands, said the Lt. Governor, Lt. Gen (Retd) AK Singh today. No one can stop the people of A&N Islands especially the people of Port Blair whether it is Leher or any other calamity. Within three days after the disaster, we all gather here to enjoy this programme, which shows the spirit of the Islands; the spirit of the people of Port Blair, he said. Disaster Management in the Islands: “When I reached the Islands, I learnt that the islands are prone to natural disasters. I wanted to reassure the people that we can face any kind of disaster that strikes. We tried our best and held exercise and then faced Lehar. The response of the Administration was good but not up to my expectations. We have noted the lacunas, which was discussed during the high level conference held later”, said the Lt. Governor. A&N Islands, he said has the largest number of groups and associations. There are so many Chairmen, Vice Chairmen in it but I could notice hardly few of them active during the disaster. “I expect the people to help their neighbours first”, said the LG. “If we want the involvement of people in disaster management, we should involve the Self Help Groups in an organised manner as suggested by the Chairman of the Cooperative Union, Shri Kuldeep Rai Sharma”, said the LG. He requested the Chief Secretary to identify Self Help Groups in every village and train them, which would be a successful and useful activity. Where there are no SHGs, the local people especially the women folk should be trained, as they are more compassionate and active, he said. Recruitment of Teachers: “When I came down to the Islands,I was intimated that there are many vacant posts lying in the departments. Out of this were 422 posts of teachers, which were vacant since past ten years. But when the vacancy was released, many others problems associated with it have cropped up”. “We have to conduct business of the government as per rules and regulations. We should have our emotions. And my emotion tells me that if there is any job, priority should be given to the people of A&N Islands. But then we have to go as per the rules and regulations”, he said. Job Reservation: On this the LG said, “First thing is that mainland is not a different country and is also a part of India. I accept and I am truly conscious of the fact that A&N has limited employment opportunities. Our challenges are more. This is the reason why our case is strong enough to argue that under limited opportunities available, priority should be given to the people of A&N Islands”. He also said that in 2007 this case was taken up very strongly and after administrative and legal consideration, it was rejected. In the current situation, if a post is advertised, we have no right to change the policy. The LG stressed that Education is an important field and we must have efficient people. Comparing Education sector with Health, the LG said that we can’t claim that we should have all the teachers from within the islands and expect doctors from outside. ‘You can’t have the cake and eat it too…’ he said. The Lt. Governor assured the islanders that he is conscious and has a responsibility towards the people of the islands. We will come to some viable solution, he said explaining that the Administration is taking up the case strongly with the centre in which 80% reservation for the Islanders will be demanded. “I will go upto the Prime Minister and to the court leaders to look at the special circumstances of Andaman & Nicobar Islands”, he said and hoped that the Administration would be able to provide a bulk of the job to the islanders. In this regard, the Lt. Governor also requested the public representatives to put the correct facts before the islanders and not to create unnecessary phobia amidst them. LGs Advisory Council: The LG observed that there is a council but hasn’t met since years. It has been revived now and instructions have been given to ensure that it meets every three months. “In the council, I expect that the members set aside their individual & party positions and come together to discuss what is good for the islands”, he said and hoped that some meaningful suggestions will come up. Education: Speaking about the education scenario in the islands, the Lt. Governor said, “The education policy in the islands is not apt for the current environment and time. This is the only place where the students are taught in five different languages. Who has the money to spend on their children to learn in five languages”, asked the LG. He further said that students are more important in the education system but it is observed that there is no role of students in the present education system. Sighting an example of Science Stream in schools, he said that the students are forced to study in English medium in XIth & XIIth Standards. If a student is taught in other languages till Xth Standard, what can be expected out of him when he is forced to study in English medium later, he asked. He also observed that there are many schools where the strength of students and teachers are the same. What is the result from it? Wherever I visit, I receive complaints about lack of proper infrastructure in schools, the LG said while hoping to have a debate on it to come to a conclusion. “To preserve one’s culture there are so many other means; not only through the means of children. Teach the children your language but don’t force him to study in your language thereby limiting his scope in future”, said the LG. Housing Colony: The Lt. Governor observed that there is no concept of Housing Colonies like in the mainland where people from different income group can have an accommodation. In this regard the Lt. Governor has requested ANIIDCO to work on this concept and to begin with Port Blair city. He assured that the complete process will be transparent. There are other proposals like Shopping Mall etc. to which the LG has directed to place them before the LG’s Advisory Council for discussion. Panchayati Raj Institution: The Panchayati Raj Institution plays a very important role in the islands especially in the absence of an Assembly. The meaning of PRI is an institution for the people, by the people and of the people, the LG said. He observed that there are some confusions prevailing among the PRIs and Administration which can be sorted out and streamlined. The LG hoped to hold a conference to discuss on how to empower the Panchayati Raj Institution. The Lt. Governor has called upon the PRI members to ensure that people do not feel left out and urged them to make public the details of funds and works being undertaken. Encroachment in the islands: “In A&N it appears that ‘encroachment’ has become the right of the people. There was a time during the settlement when encroachments by settlers were legalized. Later in 2002 a line was drawn, which is pending in the court. But after 2002 there is no reason for people to make encroachment a right. Time has come to speak the truth and tell the people that encroachment is not a right”, said the LG. He observed that there are two types of encroachment; one is ‘Encroachment of Need’ and the other ‘Encroachment of Greed’. Drawing a line between them, the LG said that soon there will be a strict encroachment drive, which will begin from the later. The administration is duty bound to protect the government and revenue land, he said while ensuring that schemes will be worked out for the weaker section. Beautification: The Lt. Governor urged the people to have a sense of ownership of the islands and keep the place neat and clean. In this regard he said that strict fine will be levied on people who spoil the beauty of the place. The LG also raised the issue wherein people hoist flags and place hoardings/ banners etc. whenever and wherever they desire. The LG has requested the PBMC to frame guidelines in this regard and to come heavy on those who try to work beyond it. The first bulletin in this regard (pre-cyclone watch) was received at 2119 hrs (1ST) on 23rd Nov, 2013. The cyclone is likely to cross ANI between Hutbay and Long Island, close to Port Blair and therefore its impact is expected to be confined to two districts namely North and Middle Andaman (N&MA) and South Andaman (SA). On receipt of the bulletin, Deputy Commissioners (DCs) concerned, DGP (I/C) and Emergency Operation Centres at Port Blair, Mayabunder and Hutbay were informed. Information was also sent to all Emergency Support Functionaries and authorities concerned such as Fisheries, Directorate of Shipping Services, Port Management Board, APWD, Electricity and PBMC. • All Secretaries concerned/HODs/Emergency Support Functionaries have been intimated both through SMS and phone calls. Key functionaries have been sent copies of IMD Bulletins. • DC (SA) and DC (N&MA) have activated their SOPs and ESFs. • The Police Department has also been informed to keep NDRF on alert. NDRF has also been informed by NDMA in this regard. • The public has been informed regarding the cyclone by SMS through all service providers namely BSNL, Airtel, Reliance and Vodafone. • All India Radio and ACN cable network are broadcasting information regarding the cyclone alert. Information and Publicity Department has issued information in this regard to all News Papers and Channel 24. • AIR has been requested to continue its service beyond 1100 pm (when its service closes) to 5:30 am to allow dissemination of bulletins to public. • Dos and Don’ts during cyclones were downloaded from NDMA Website and have been disseminated by Information and Publicity Department both through AIR and Cable Network and also at movie screening Ambedkar Auditorium. • Areas prone to storm surge and inundation have been specifically identified by the DCs for information dissemination/evacuation as advised by IMD. • DCs have informed elected representatives such as PRIs and PBMC and are taking their assistance for information dissemination to public and for moving public from coastal hutments to safer areas etc. All elected representatives concerned including the Member of Parliament have been informed by State Control Room through SMS. Community Task Forces have also been activated by the DCs. • Queries/calls from public arc being attended to by the Control Room/EOCs. • All modes of communication including SAT phones, INCOIS VSAT based VoIP telephony and Video Conferencing through DCN network have been activated. • DC SA is also regularly updating his disaster management Facebook page. Some like Andaman Chronicle are also providing required information to public through Facebook/website. • Mobile Public Address systems are also being used by joint revenue and police teams to alert the public regarding the cyclone and to persuade coastal hutment dwellers to move to relief shelters. • Identified relief shelters and relief godowns have been activated. • Shipping and Fishing operations have been suspended. • Secretary Fisheries has given his detailed report regarding information dissemination done amongst fishermen and some fishermen from Guptapara, Hutbay, Yerratta and Dashrathpur are at sea from before and have not as yet returned. He has informed the Coast Guard in this regard. Telephonically IG Coast Guard has also been requested for possible assistance. • Secretaries/HODs concerned have also been advised to keep tree removal squads (APWD, Forest and Police/Fire Services) and power restoration squads (Electricity) ready. • Civil Supplies department has been activated and kept ready for food supplies requirement. • Local IMD is in constant touch with the Administration. • As advised by IMD, over 3600 persons in coastal hutments in 7 Islands of North and Middle Andaman and South Andaman Districts had been moved to safer places. • The cyclone gained maximum intensity around 6 am and lasted till around 7:45 am. However, IMD has predicted wind speed of 65-75 kmph gusting to 90 kmph for next 12 hours and that extremely heavy rainfall (25cm or more) will continue for next 24 hours. • The impact was felt more strongly in South Andaman than Middle Andaman with Port Blair being hit the most. • Widespread uprooting of trees and falling branches has caused extensive damages to houses and road blockages. Some places where falling trees have been reported are Haddo, VIP road, near Secretariat building, ANIIDCO road, Megapode road, Raj Niwas gate, Junglighat, Shadipur, Bambooflat, Chunabhatta, Gandhi Park road, Ferrarganj, Sippighat etc. Widespread damage to houses reported from Haddo, Junglighat, Dean Street, South point, Chakargoan, Wandoor, Lambaline etc Joint PWD, Forest and Fire services squads have been on the job. NDRF team here has also been deployed. • Land slide has been reported in Dignabad, South Point, and Port Blair. • Traffic on Andaman Truck Road has been suspended. • Widespread power failure has occurred in South Andaman. Power disruption in Middle Andaman. • Telecommunication services have been affected in both districts, however phone lines and cell phones are working in some pockets. • Water logging has been reported in certain low lying areas such as School line, Mohanpura, Garacharma, Sippighat, Chouldari, Stewartganj, Carbyn quarry and near LightHouse junction in South Andaman. Rescue operation with Gemini boat done in Sunder Colony near Megapode Hotel (Port Blair) where 58 persons were rescued from submerged houses. Rescue operation were also done at Betapur (2 persons) and Kanyapuram (14 persons) in North & Middle Andaman. Water logging in some places has caused road blockages as well. After the high tide at night receded, water in some places went down. • IG Coast Guard and ANC have been requested to help locate the fishermen who had left prior to November 24th 2013 but not returned. 16 boats at Guptapara with 3 fishers each, one boats each at Yerrata and Dasratpur yet to return. At Hutbay, 4 boats yet to return. • State Transport Services both Local and inter-state have been suspended till roads are cleared. • Shipping and inter-island air services have been suspended. Mainland- island flights have been cancelled. • Danger Signal 7 has been hoisted in port. • No casualty reported as yet. • All India Radio disseminated bulletins all through. Private Cable and channel networks were also used. However, Doordarshan was not operational. Jarawas in Tirur: Irreversible Cultural Damage! Useful site to view film on megashare9.